When seeding, it is painful to see some seeds on top of the ground, prompting you to need to increase down pressure, or in some cases, add suitcase weights. The problem is that before you got out of the cab and checked, you didn't know that the downforce was set incorrectly. 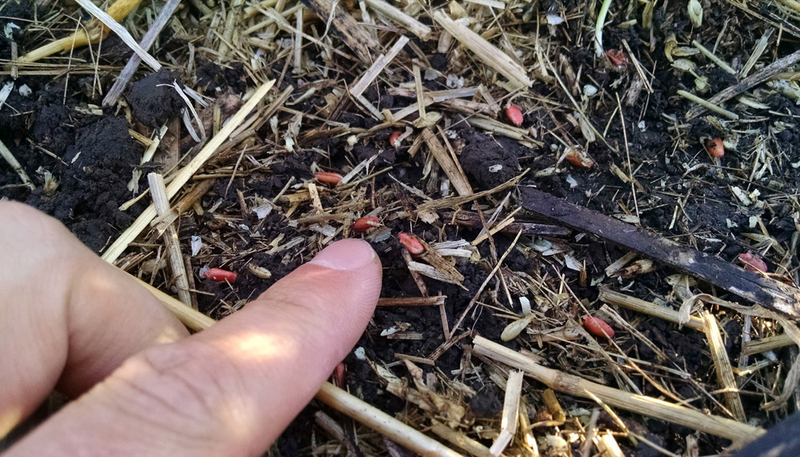 Your goal is to get each seed into moisture so it will grow, but not to have so much downforce that the gauge wheel of the row unit is creating compaction that won't allow the plants to have a good root system. With a single downforce setting across the entire drill, it is challenging to get this correct. 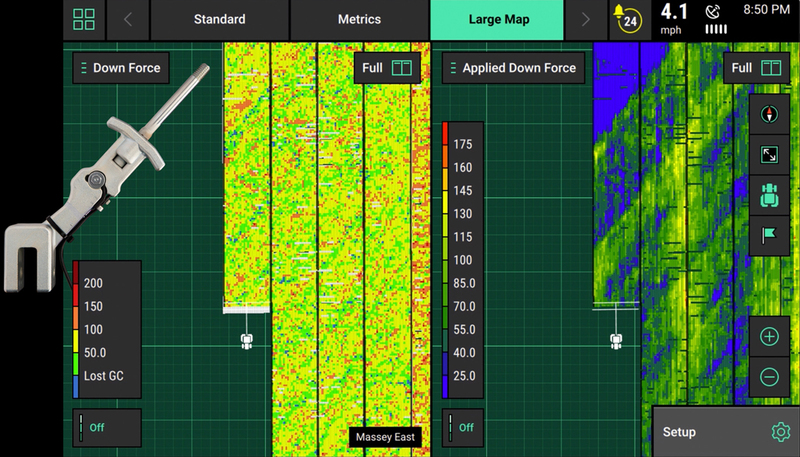 Precision Planting saw this as an issue as we worked with growers in the plains, and has spent years digging into the issue of downforce settings on seeders and doing testing and development in those states. 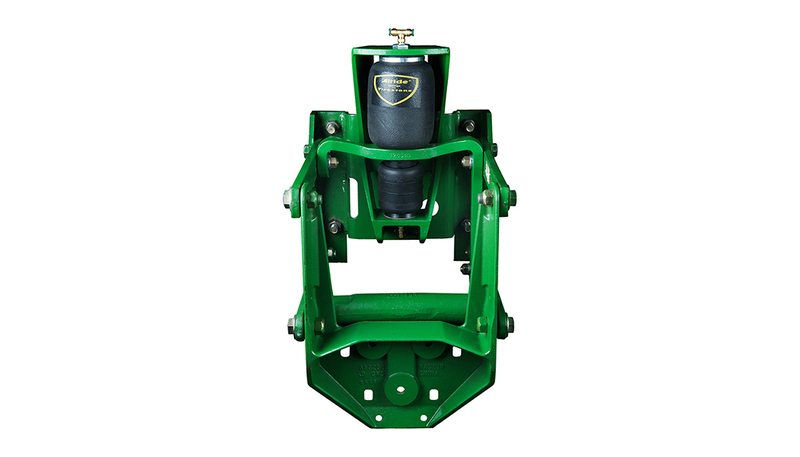 The result is SeederForce, an automated downforce control system that can be added to your seeder or drill to give you control of downforce and to prevent seeds on top of the ground, and eliminate sidewall compaction. 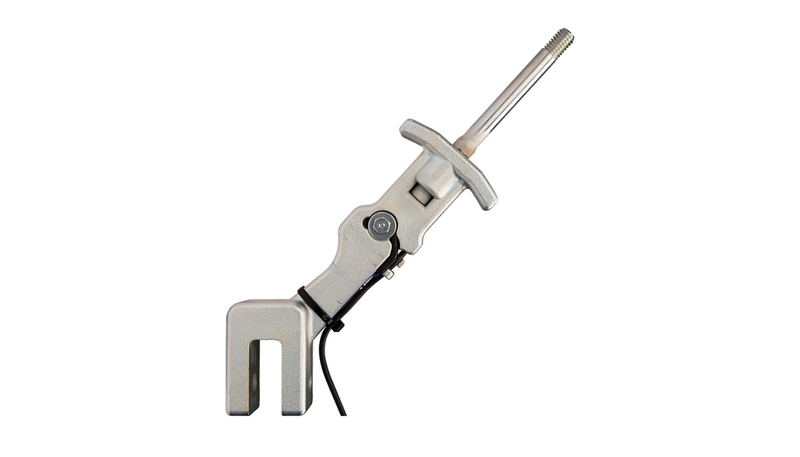 SeederForce uses load cells on the row units of the drill to measure how much weight is on the gauge wheel. 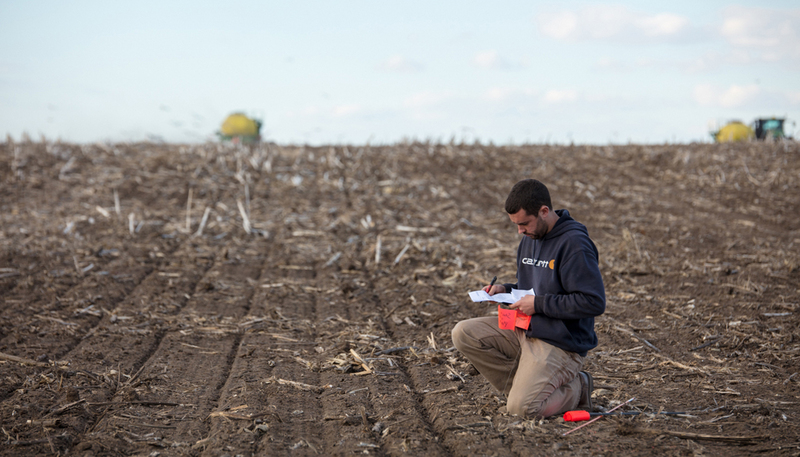 By maintaining a consistent amount of weight on the gauge wheel, you can be confident that you are placing seeds at seeding depth because, in order to have weight on the gauge wheel, the disk opener has to first be creating a seed trench at the depth that it is set. From the cab of the tractor on the 20|20 display, the operator selects how much gauge wheel weight they want to have on the wheels of the drill and the SeederForce system makes automatic adjustments from there to maintain the desired weight. SeederForce Section control varies the downforce applied to each rockshaft of the drill. Each section has a few load cells on it and the downforce is adjusted based on the average of these load cells. If one section of the drill is behind the tractor and needs more force to penetrate through tracks, it gets that weight without the wing sections having to have more force applied to them. SeederForce Row control varies the downforce applied to each row of the drill. 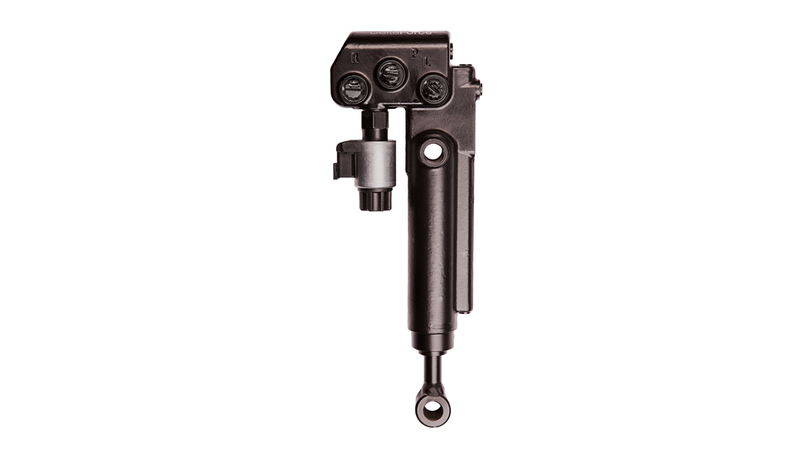 Each row has a load cell as well as a hydraulic cylinder in place of the spring. If a single row needs more force to cut through residue and get to depth, that row gets more force; the row beside it does not. Each gauge wheel on the drill has consistent weight because each row's downforce is automatically adjusted to what it needs. 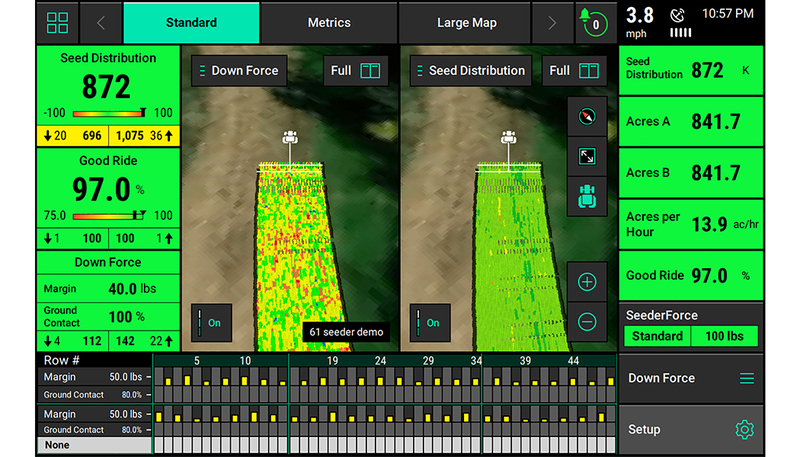 When SeederForce is installed on your drill, you not only get automated control of downforce, but you get visibility of seeding distribution as well. 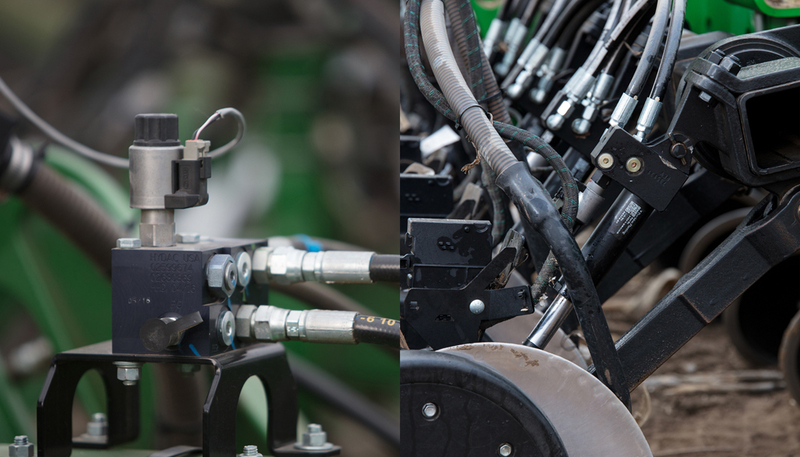 Now you can know if there are rows of the drill that are not planting correctly, and catch those issues before they cost you money.